After power producer Iberdrola announced the closure of their last coal plants, the Spanish government has said it might intervene to keep them open. Such an intervention, write energy experts Gerard Wynn and Paolo Coghe, is taking a page out of Donald Trump’s book. It is costly, bad for the investment climate, and for the planet’s climate. Spain’s proposal on 13 November to give the government a veto on power plant closures is an extreme example of power market interventions in Europe, which is already burdened with capacity payments to prop up gas, coal and nuclear power. The U.S. is seeing similar interventions with the Trump government’s recently proposed “grid reliability” payments to coal and nuclear power. Such interventions are highly likely to add to the cost of energy both directly, through the consumer or taxpayer cost of capacity and equivalent payments, and indirectly, by tending towards system over-capacity. In addition, random government interventions will increase investor uncertainty. The Spanish government made it clear that it may seek a veto on coal plant closures, which it is seeking to prevent, regardless of the wishes of the electric utilities that operate them. Some background here is in order. After the announcement in May 2017 by ENEL (which owns around 70% of Endesa’s shares) of the closure of two of Endesa’s coal power plants in Spain – Teruel and Compostilla, the Ministry of Energy, Tourism and Digital Agenda announced it would prepare a regulatory instrument with the intention of allowing the Government to intervene in the decision of a company to shut down a large combustion plant, in case the Government deemed the plant was necessary for security of supply or economic reasons, among others. In practical terms, this instrument would prevent companies from being able to shut down their plants, even though they wanted to. This instrument was subject to a public consultation procedure which finalized on 15 September, although there was not a draft text available at the time. At the beginning of November, according to Spanish media, the Ministry of Energy decided to sideline the instrument until it received feedback from the national Expert Committee on Energy Transition on “how an energy transition should be carried out”, also because the instrument had received no support from other political parties in the Parliament. Nevertheless, after Iberdrola announced the closure of their last coal plants (874 MW located in Spain) and the Baleares Government said it wants to shut down two groups of Alcudia coal plant by 2020, the government has published the draft text and sent it to the competition and energy sector regulator, the National Commission of Markets and Competition. This body is enabled to participate in the elaboration procedure of this instrument through a non-binding report. The public participation procedure is now open until 18 December. The stated goal of the decree was to preserve the country’s security of supply. But Spain has generating over-capacity, with a capacity margin of around 30%, measured as the excess of supply above peak demand, far exceeding a prudent 10-15% margin for grid operators to insure against large power plant outages and the variability of wind power. The coal decree seems more about securing votes, in an echo of the U.S. Trump administration’s support for coal. Spain’s wide capacity margin is a result of other Spanish government interventions, and in particular the country’s capacity market, which pays for coal, gas and hydro power plants to remain on the system, regardless of whether they generate electricity. We see three costs of such intervention. First, there is the direct cost of the Spanish capacity market. IEEFA last year reported that capacity payments and payments for demand-response in energy-intensive industries totaled nearly €1 billion annually. Second, the capacity market (as well as rules to prevent the closure of idle capacity) has led to over-capacity, where cleaner burning gas power plants are now all but idle, in favour of older, more polluting coal plants. For each of the past five consecutive years, Spain’s 25 gigawatts (GW) or so of combined cycle gas turbines (CCGT) have operated at below 20% capacity. Capacity payments propping up widespread idle generation represents poor value for money. And if the result is to favour coal over gas, there is an additional cost in SOX, NOX and CO2 emissions which contribute to air pollution and climate change. Third, confused signals from government will cloud sound economic decisions by utilities. Last week, the Spanish utility Iberdrola announced that it wished to close its last two remaining coal power plants in Spain, stating that this would not undermine grid stability, given that Iberdrola operates some 5.7 GW of CCGTs there. The government’s draft decree this week appeared to target the Iberdrola announcement. Two weeks ago, we published a report arguing against the decision by Endesa, another Spanish utility (70%-owned by Enel), to invest some €400 million to extend the life of three coal power plants, Alcudia, Litoral and AS Pontes. We pointed out that Endesa’s CCGTs in the first half of this year ran at just 12% of their capacity. That was notwithstanding a 208% increase in CCGT output compared with the same period the year before. In suggesting a re-think, we contrasted the poor financial performance of Endesa’s fossil fuel generation with the expected double-digit returns on its successful bid this year to build more onshore wind. 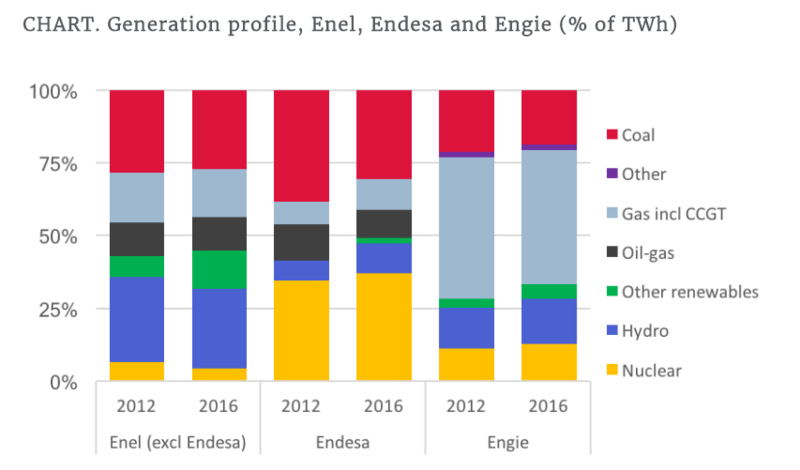 And we pointed out that Endesa’s strategy of investing in old coal power plants did not fit with its parent’s (Enel Group) focus on renewables, digitalisation and customer services (see chart below). Coal plant extensions may also ultimately run foul of an emerging trend towards coal phaseout in Europe. France has confirmed it will phase out coal by 2022; the UK and Italy will complete their phaseouts by 2025; while Finland and The Netherlands are setting a legislative end date of 2030 (with a likely earlier completion once additional carbon price instruments start to bite). Spain’s Iberian neighbour Portugal has also confirmed that it will be out of coal in advance of 2030, with scope for this to be considerably closer to 2020. And recently, both Denmark and Austria committed to joining a new international “Powering Past Coal Alliance”, and to accelerating their own transitions out of coal. Spain is therefore increasingly isolated among its Western European peers, who have recognised that phasing out coal provides the most cost-effective means of reducing carbon emissions and health impacts while creating a market incentive for investment in clean energy alternatives. There is another side of the argument: by upgrading its coal plants, Endesa can preserve electricity supply market share. However, in view of the above we argue that it should reconsider these investments, to focus on growing the more future-looking side of its business. Political opposition of coal or other power plant closures will only weigh against any such careful consideration of strategic options. This article has been republished with permission from Energy Post; it is based on a report for the Institute for Energy Economics and Financial Analysis (IEEFA). Gerard Wynn is Energy Finance Consultant (gerard.f.wynn@gmail.com). Paolo Coghe is President, Acousmatics (acousmatics@protonmail.com). An earlier version of this article appeared on Gerard Wynn’s Energy and Carbon Blog, which he writes with Gerard Reid. Special thanks to Carlota Ruiz-Bautista, lawyer at the Madrid-based Instituto Internacional de Derecho y Medio Ambiente (IIDMA), who generously provided input for this article. IIDMA has published an article on this issue on 23 November which you can find here. Note that IIDMA has also filed a lawsuit against the Spanish government’s “transitional national plan”, which it says “allows coal plants to emit above EU limits”. More information here. Can the governments be sued for this promotion of coal and promotion of CO2 emissions? Under US law, they *can*, for wilfully causing climate damage — but I don’t know about other countries’ law. The policy of the Spanish government is hard to understand. The U-turn in the financial crisis was comprehensible: austerity pressures from Brussels, Frankfurt and Berlin to kill subsidies, and regulatory capture by the incumbent Spanish utilities desperate to protect their fossil generating assets. The situation today is that renewables don’t need any subsidies and the utilities now want to build cheap wind and solar farms. So what is going on? Rajoy is a psychopath and a fascist. He seems to be owned outright by coal interests. Remember, he’s the one responsible for the “tax on the sun”. He needs to be thrown out of office yesterday.